The kids are almost out of school, which means a few months of ‘Mom, I’m bored!’ Why not provide something fun for your kids, while also earning some extra cash this summer? 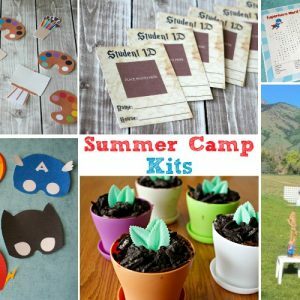 You can host an awesome summer camp for kids easily with the help of our Summer Camp Kits – full of tips, instructions, recipes, crafts and LOADS of printables to help save you work while hosting a great camp! And if you don’t feel like doing a whole summer camp – these make fabulous preschool theme kits, party plans and ideas or just awesome activities for kids! That’s right, you can put on a successful and PROFITABLE kids summer camp this year, and our Summer Camp Kits are full of helpful stuff to save you a ton of time and work. Almost all the planning is done for you! We’ve even got four themes – Superhero, Wizard, Science and Arts & Crafts – so you can pick what fits your kids (and the kids you’ll be inviting to attend) and their interests! …or test your skills through a security maze during our Superhero Training camp! …and let their creative side shine in Arts & Crafts camp. Each summer camp kit comes with TONS of printables to help with your successful camp – banners, name tags, games and filler activities, signs, food cards, photo booth props and much more! You can nab your summer camp kit HERE, or even get multiple to host a variety of camps and bring in even more extra money this summer! These are ALL included in our Busy Mom Bundle, along with other fabulous printable packs! A YEAR of Meal Plans plus Recipes – on a budget! Y’all know how much we love super heroes, right? I mean, even on this site my kids go by their chosen super hero names, like my girl who loves Wonder Woman. 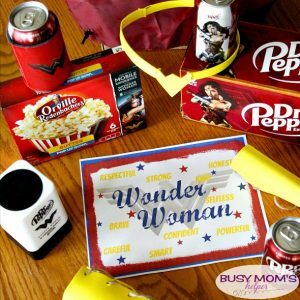 To get ready for the upcoming film, we’ve got all the supplies we need for a fabulous Wonder Woman Inspired Movie Night! Food, drink, and even fun tiara & bracelets inspired by the movie make it a complete party for the woman (young or old) in your life! You can probably guess what my drink of choice for a good movie night (or anytime, really) is, right? Yup, I’m a Dr Pepper® girl through and through – and watching just wouldn’t be the same without some delicious Orville Redenbacher’s® popcorn! What makes this even BETTER is that now you can grab the digital coupon online from Kroger to save on the budget – and that makes any movie night wonderful! I’m totally loving the limited edition Wonder Woman designs on both Dr Pepper AND Orville Redenbacher’s®. Save $2.00 on Orville Redenbacher’s® Popcorn and Dr Pepper® when you buy ONE (1) Orville Redenbacher® Popcorn, any variety (6pk) and ONE (1) Dr Pepper® any variety (.5L 6 pk). Expires 5/21/2017. Limited Time Offer; while supplies last. We got some fun goodies in the mail, including Orville Redenbacher® fun pop-up bowls in this pack of yummy popcorn! I can carry my Dr Pepper around without freezing my hand in the little cushion holder, plus the great tote bag – everyone knows my love of this drink, so may as well show it off. My whole family is enjoying the Dr Pepper & Wonder Woman inspired speaker – a great way to play some tunes while getting ready for our movie night. I’m so anxious for Wonder Woman to hit theaters June 2nd – it’ll be a great night out with the girls, and MAYBE we’ll take the boys 😉 One of my favorite things about movies are that they bring friends and family together, and we have plenty of fun memories watching together while treating ourselves! What makes Wonder Woman even more special is that it’s the first female super hero to land her own movie – that’s incredible! It’s a cultural event and we’re all prepared to join in celebrating such a remarkable hero like Wonder Woman, all while enjoying Dr Pepper & Orville Redenbacher’s®! Be sure to stock up at Kroger, especially since you can save with their digital coupon – but it’s available for a limited time so hurry! And since we’re sure you have a hero in your own life, check out this awesome sweepstakes – maybe YOU can win! What better way to celebrate the hero in your life? Enjoy this colorful & creative Wonder Woman inspired printable wall art – just click below to download and print it out (we sized it to 8.5×11 – recommend printing onto cardstock for best quality). Display it in your home, your girl’s bedroom, or even in the movie room as you prepare for the film! My girls were super excited to have their own Wonder Woman inspired tiara & bracelets, so they can go to the movie in style when it comes to theaters June 2nd! You can make your own in just a short time – they’re way easy! Cut out the V-like shape from Wonder Woman’s tiara. If desired, draw or sketch in the details like you see her wearing on your Dr Pepper or Orville Redenbacher’s® packaging! Cut out a strip of the foam for the band to go around the head – size it to the person’s head, having the V-like shape pointing down in their forehead. Staple (or glue, allowing to dry) the shape to the band. For the bracelets, cut out a strip sized to go around the forearm of the person. Use a hole punch along the two open edges, then tie it up together with the thin rope or ribbon (make sure it’s not too tight, and that they can take it off when needed). That’s it – now your little hero is all set for the upcoming Wonder Woman film, hitting theaters June 2nd! Who’s the hero in YOUR life? Whether you’re with the light side or dark side, you’ll love this Ultimate List of Star Wars Ideas for May the Fourth! Printables and crafts, decor and games, even costumes and more. You’re bound to find some fantastic Star Wars project worthy of the Jedi or Sith in your family! If you don’t know by now, our family is pretty big into Star Wars. And when I say big, I mean HUGE! Of course we do plenty of fun Star Wars crafts throughout the year, such as our Rebels Tshirts or puppets, but also enjoy the films quite often – lately we’ve been rewatching The Force Awakens & Rogue One! Every chance we get, we love to create as a family and when we can create in a way that’s both yummy and nerdy? Well that’s just a bonus! 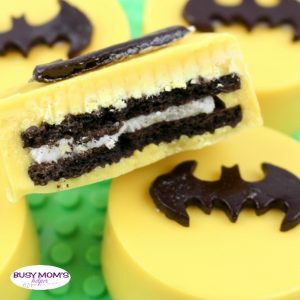 These Batman Oreos were so fun and so easy to make, and they’re both yummy AND celebrate our love of all things superhero! Contains affiliate links that help this blog run at no extra cost to you. See our disclosure. The ingredients are simple and easy to find, which makes these Batman Oreos even better! I’ve included affiliate links for your convenience, but you can also find most of these at the local grocery store. Line a baking sheet with wax or parchment paper. Set aside. Add the yellow candy melts to a double boiler pan over medium heat. Stir occasionally until melted and smooth (about 3-4 minutes). Transfer to a small bowl for easier handling. Fill each cookie mold with 2 tablespoons of the melted yellow candy melts. Place an Oreo cookie on top and then fill up the rest of the mold with additional melted yellow candy. Chill for 30 minutes to allow the yellow chocolate to harden. Gently pop each cookie out of the mold and place on the lined baking sheet. Peel apart the black Batman logo from each gummy candy and place on top of the coated Oreo cookies with a dab of white icing on the back. If you do not want to use the gummy logos, you can just pipe the batman logo on each cookie with a black icing tube. *Store in a single layer, in an airtight container for up to 2 weeks. Will you be trying our Batman Oreos? What theme would you choose? Since Christmas is fast approaching, some of us are making a mad-dash trying to find fun, budget-friendly and EASY gift ideas for neighbors, friends and more. 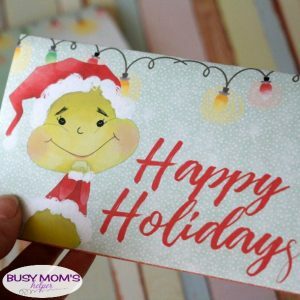 These Printable Grinch Popcorn Wrapper Gift Idea are just the ticket – and about as easy as they come! Aren’t they adorable?! We’ve got one of the Grinch himself, along with the sweet Cindy Lou Who. They print onto 8.5×11 paper – I recommend cardstock for durability and ease of folding smooth creases. Once you’ve downloaded the two files and printed however many you want, cut out the large rectangle, fold the the two creases, then either glue (or tape) where the convenient line says ‘GLUE HERE’ on the inside of the back sheet. Slide in a pack of microwave popcorn, and you’re all set to gift it to anyone left on your list! These would also be super cute party favors, or thank you’s for a mail person or delivery drivers. As much as I love how Cindy Lou Who looks, I’m totally in love with the Grinch and his big grin! So sweet! Want a fun and exciting centerpiece for your thanksgiving dinner? One that not only looks great but doubles as a dessert too? Well this Autumn Splendor Centerpiece is sure to impress your guests and it doesn’t cost you an arm and leg to make it. 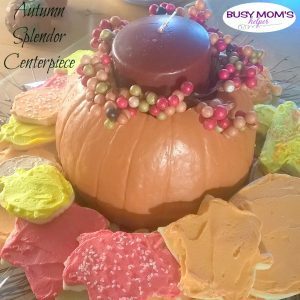 Autumn Splendor Centerpiece is easy to make and can be changed easily if you need or want. All you need is a simple sugar cookie recipe with frosting, a stick wreath easily found at a craft store, fake pumpkin, candle (whatever color), and some little decorations to go around the top which can be left out if you want. First get your fake pumpkin and cut a hole in the top large enough to fit your candle. I just used a steak knife which seemed to work great but it did make a little bit of a mess with Styrofoam all over. Place your candle in the whole. Next if you want you can get little decorations to go around the ring of the pumpkin and candle or you can leave it blank. I found some cool little beads I guess you could call them and pinned them to the pumpkin. Just walk around a craft store and you can find some fun things like maybe leafs, jewels, feathers, anything you would like to dress up your centerpiece. On your stick wreath (horrible name I know but I don’t really know the technical name for it), place a sheet of cellophane to help support the cookies a little better and so people don’t get any weird sticks in their cookies. Make it a little bigger than the wreath because when you place the pumpkin on it it will come in a little bit. Place decorated pumpkin in the center of the wreath on top of the cellophane. Make sugar cookies and decorate them. My sugar cookie recipe and frosting is just basic – nothing too fancy, recipes below, and I also didn’t spend hours decorating mine because the only people that saw it was my little nephews and nieces. Feel free to get creative and design however you want. Plain leaves look great on this wreath and doesn’t take forever to decorate. You can get as creative as you want or as simple as you want with the Autumn Splendor Centerpiece. I cut my cookies into different leafs, acorns, squirrels, turkeys, apples, and a few flowers. Then I just put simple frosting on them in colors of red, yellow, orange, brown. I then froze them and an hour before we sat down pulled them out, placed them around the wreath, not too far out on the wreath so they didn’t fall off but did a few layers and placed in the center of the table. It looked great without all the hard work and I had a great centerpiece and dessert tray. Cream butter and sugar together until smooth. Beat in the extracts and egg. Mix in baking powder and flour until combined. Roll out onto a floured surface until about ¼ inch thick and cut into shapes with cookie cutters. Place on greased cookie sheet and bake for 6-8 minutes. Let completely cool before frosting. Cream all ingredients except powdered sugar. Slowly add in powdered sugar. Can add more or less milk for different consistencies if needed. Separate into bowls and add food coloring. The nerdiness of my family continues with our love of all things Harry Potter. My daughter is especially fond of everything to do with the wizarding world! When I showed her The Unofficial Guide to Crafting the World of Harry Potter, she squealed in excitement – literally, and for several minutes as she combed through the pages wanting to try every single project right then and there. Guys, this is like THE Book for Harry Potter Crafts! Trust me, whether you’re a muggle, witch or wizard, this is the perfect gift for Harry Potter fans! Plus an awesome GIVEAWAY! I received a free copy of this book to facilitate this review. All opinions are mine alone. This post contains some affiliate links that help support this blog at no extra cost to you. See our disclosure policy for more info. While my girl insisted on doing several crafts in one afternoon, I finally convinced her to just try one for now so that I could take the time to share this with you. It was super hard narrowing it down from the 30 magical wizard crafts to try! We finally decided to start out with a Pencil Wand – the instructions were super simple to follow, and the supplies weren’t hard to find. We quickly made two pencil wands to show off – and she can’t wait to use them! Whether that’s to have a wizard duel with her friends or write her latest potions assignment, I’m not quite sure, but at least she’ll be prepared for either one! Trust me, these THIRTY Harry Potter crafts are so much fun, and simple enough to do for a party, family night or simply because they’re awesome. If you or anyone you know is a Harry Potter fan, you’ve got to nab The Unofficial Guide to Crafting the World of Harry Potter (by Jamie Harrington) now. Then get your magic going with these fabulous projects! Summer Party for Kids – Free to Be Anything! Summer is an awesome (albeit busy) time, with lots of playing outside, water games and activities. With my mom and youngest sis in town, we wanted to celebrate with an awesome backyard party – complete with DIY PVC sprinkler, of course! They all had a blast with their Summer Party for Kids, and were ‘Free to be Anything’! As you can see, our summer party was kind of a ‘messy party’ themed event – something that I’d normally be REALLY hesitant on. Why, you may ask? Because being outside much in the summer often means major issues for us – one kid with asthma, two with severe skin sensitivities and one with mild skin sensitivity. Having to wash their clothes much usually means itchy skin and possible asthma flare-ups with the pollen and such being brought in. And who really needs harmful ingredients or coloring rubbing constantly on their skin from their clean clothes? Luckily I can be more laid back this year because all® free clear liquid helps my family deal with the sensitive skin and allergens, helping us enjoy our time without worrying about itching later! I restocked last time I was at Walmart – it’s easily found in the laundry detergent section! Then we were free to enjoy our summer MESSY party! In case you were wondering, this was them BEFORE all the colorful, wet mess…. We started off with some sidewalk chalk – which tends to get on EVERYTHING, including their clothes and skin. Then we had a total BLAST with some food-colored water balloons! We went through a TON, but they loved every bit of it – especially squishing them on Grandma and me. Heck, they even enjoyed coloring THEMSELVES with the balloons! Like we told them – they’re free to be messy for this awesome party! Then why not some colored BUBBLES? Plus we’re showing off our colorful outfits after that water balloon craziness. It was especially hard for me to just sit back and enjoy as they did body paint all over the giant paper roll – and on themselves. And each other. Really, it was just EVERYWHERE! But they had such big grins on their faces, I knew they were having an amazing time just being free. Totally worth it! Lastly, it was sprinkler time! We had to build our PVC Pipe Sprinkler, but now just stick it in the garage when it’s not in use so we can pull it out anytime for a bit of water fun! Note: Since size preference may vary per person, I’m just listing the supplies and general directions, not measurements. It’s really simple to see what sizes as you lay it out and put it together. We did this in a quick evening. After deciding your layout and the sizes of pipe you need, cut the pipe to the appropriate lengths. Attach the Elbows and T’s to piece it together. You may need to add bars of pipe between both for support AND for some spray at a lower level 🙂 Don’t forget to use the pipe glue to secure it, and keep water from finding other ways out! Be sure to close off all ends, adding the water hose adapter to one edge. Since water pressure varies – start with a few holes and see how strong it is. Add more as you see fit, but be careful that it’s not so few that the water hurts – and not so many that there isn’t enough water pressure. We added holes at the tops, sides AND a few bottom spots for an all-around sprinkler! The kids LOVED helping put our sprinkler together, but not as much as running through the water!!! I even added a few sponge balls, hanging from the pipes – just cut sponges and hot glue (or string) together. Hang from the pipe at different levels for some additional fun! They couldn’t get enough of this, so I think I’ll build another one (and find another hose – hmmmmm) so there’s even more for them to run through without bumping into each other as much! When we were done, we HAD to have a tasty popsicle treat, of course, because what party comes without a snack? Since it was outside, I had very little clean up to worry about (other than the broken water balloons, but they took care of that like a race – fun, yet helpful) other than the laundry. One obvious way I can tell it’s not as harsh for my kids’ clothing – therefor, their skin – is that it isn’t colored, because WHY would you need a color added to your laundry anyway?! Even the all® free clear mighty pacs® are clear. Since this time of year brings some bad seasonal allergies for our family, making the asthma and skin irritations worse, I’m so glad I can rely on the #1 detergent recommended by Dermatologists, Allergists, and Pediatricians for Sensitive Skin. It removes 99% of the everyday and seasonal allergens – including cat and dog dander, dust mite matter, ragweed, grass, and tree pollen….definitely a relief in Texas! The all® free clear detergent was even awarded the Seal of Acceptance by the National Eczema Association for having no dyes, perfumes, certain chemicals, and irritating residues. Like I said – who needs extra ‘stuff’ in their cleaners? all® free clear is not intended to treat or prevent allergies. Please follow directions on the packaging exactly. Connect with other parents HERE who believe ‘Free to Be….’ is the way to be! While we do most of our family trips during the school year (I know, shame, right? Oh well!) it’s getting to be vacation season for a lot of others. I decided to put together this Magical List of Disney Vacation Fun and Resources to help you out for your next family Disney trip! Contains affiliate links that keep this blog running at no extra cost to you. See our disclosure. 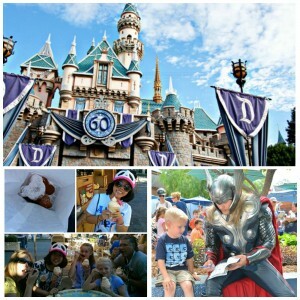 You can count on Michael’s VIPs for the best tour guide services, from planning, to at the parks & everywhere between! Disney isn’t just for kids! Summertime is cookout season. If you’re planning to host a fun and casual backyard get-together with friends, send everyone on your guest list this cute printable backyard barbecue invitation. Sometimes summer seems like one big holiday. Sure, the adults still have to work, but when the kids are at home, everything slows down. My family likes to take advantage of summer holidays to invite friends over to hang out in the backyard and enjoy food from the grill. There’s Memorial Day, Independence Day, and Labor Day – but any weekend is a good excuse to have fun. Our parties are super casual. Usually, my husband cooks hamburgers and hotdogs on the grill. We ask our guests to bring a potluck of simple, picnic-style side dishes like pasta salad, chips, and fresh fruit. The kids run and play in the backyard while the adults get to sit and chat. 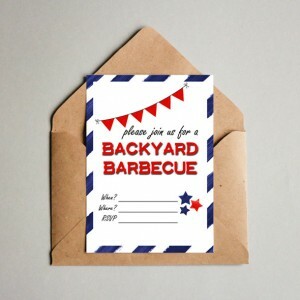 This printable backyard barbecue invitation is red, white, and blue for those patriotic holidays. It’s also generic enough that you can use it all summer long. The text simply says “Please join us for a backyard barbecue” and has space for you to write in the date, time, location, and contact info. If you’d rather type the details than write them by hand, open the invitation in Adobe Reader. Click ‘add text’ and type on the lines. You can change the font and size. The ones I used are called Aventura and Freestyle Script. You should be able to find them for free at your favorite font sites. This card measures 5”x7” and can be printed on stationery cardstock for a flat 5-by-7 invitation. You could also print it on regular 8-1/2”x11” card stock or paper, but you’ll need to trim it. It’s that time of year again – graduation! 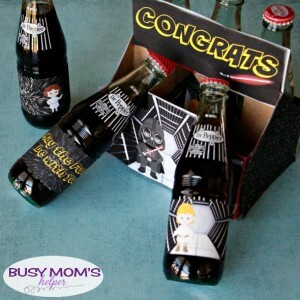 Whether you know someone in college, high school or even elementary school (even my preschooler has a graduation), these fun Star Wars Graduation Bottle Set Printables would make the perfect gift for Star Wars fans. You can even choose the dark side or the light – or just do one side of each. It’s all about a balance in the force anyway, right? With May the Fourth coming up right around many graduations anyway, it’s the PERFECT thing to give! Now, I designed these for a 6-pack of glass Dr Pepper bottles, but it can fit most 6-pack glass bottle packs like this, you just may need to trim a little from the center. Print them on 8.5×11 paper – I highly recommend using cardstock, but regular paper can work fine. It just isn’t as durable. On the ‘front’ pieces, cut as you see below so you can wrap those sides onto the part in the middle that sticks up. Ya, that sounds confusing – but just look at this picture to help and it’s really easy…. 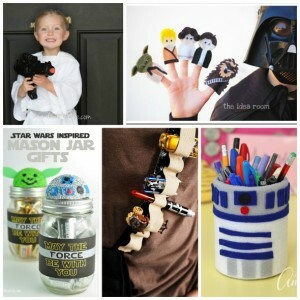 You can whip this up in a jiffy for the perfect Star Wars graduation gift! Now the question remains – will you choose the dark side, or the light? Or maybe a little bit of both? In just a few more weeks it’ll be May the Fourth – and us Star Wars fans are super excited! Our family MAY go a little crazy, but it’s such a great time for us to do some extra family things around something we all enjoy together. I put together this fun Star Wars Puppets Printable for another thing the kids can play with – and sharing it with y’all! I figured it would be a neat Star Wars kids activity they can use their imaginations with, that takes hardly any effort on your part 🙂 We’ve done a few crafty-type things – such as this Star Wars banner, this neat FREE activity book and even clothes like our Rebels shirts and lightsaber skirt! Contains affiliate links that support this blog at no extra cost to you. See our disclosure for more info. Cut out the puppets and lightsabers. Use tape or glue to attach them to craft sticks. Let your imagination go and have fun playing with favorite Star Wars characters! 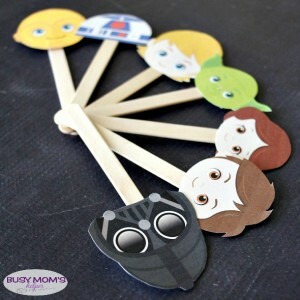 Whether your kids want to have fantastic lightsaber duels, secretly steal plans for the Death Star, or even take on the massive weapon of The First Order, they’ll love using these fun puppets in their playing! If your child’s artistic, perhaps they could design and cut out some outfits to go along with these guys. How would Han Solo look in a robot body? Or try out Darth Vader in a dress meant for Princess/General Leia?